The stretch of sub-50 degree highs we've observed has been fairly long. Through Saturday, we have gone 135 days without a high of at least 50F - you have to go back to November 1st for the last 50F+ high in the Twin Cities. That ranks as the 15th longest stretch of sub-50F highs, and with the high not even approaching that mark Sunday we'll move into a tie for 14th place. If we didn't hit 50F this Thursday, we'd tie for 10th place. Again, if we don't make it to 50F on Thursday, we should be able to on Friday, with highs in the 40s and 50s across the state. 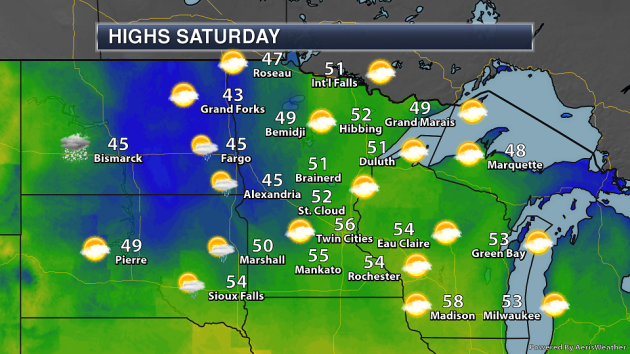 And the warmth will continue into at least Saturday, with more widespread 50s expected across the state. 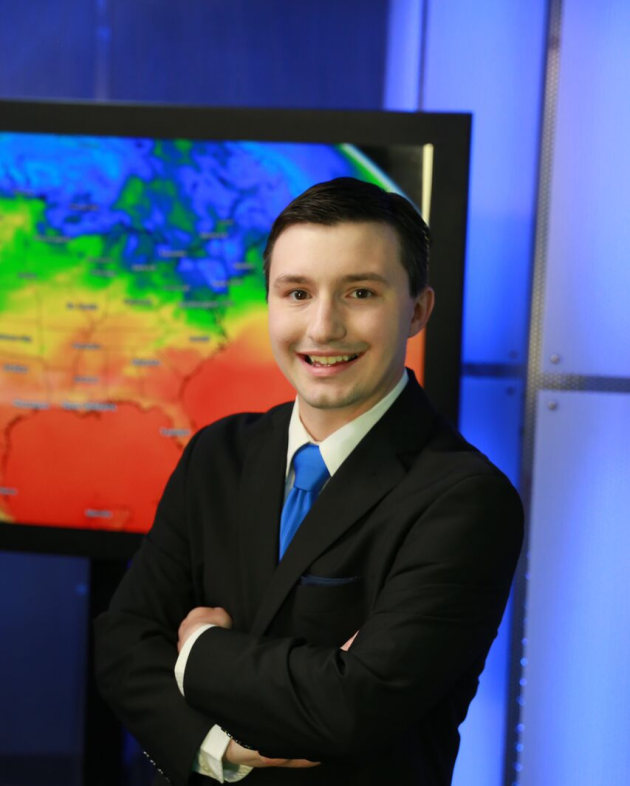 I know I already can't wait to get outside and enjoy this nice spring weather in the forecast - and to think, these highs will also be above average! 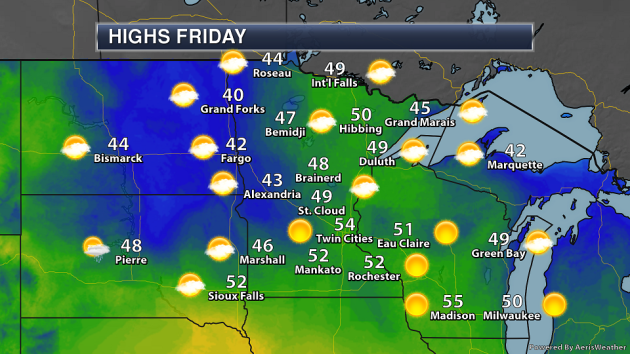 The average high next Saturday is 45F in the Twin Cities. Thanks to the heavy rain and snowmelt over the past several days, major and historic flooding has occurred across parts of the central United States. According to NWS Omaha, at least 16 of their river forecast points have reached record levels over the past few days, including three locations along the Missouri River. 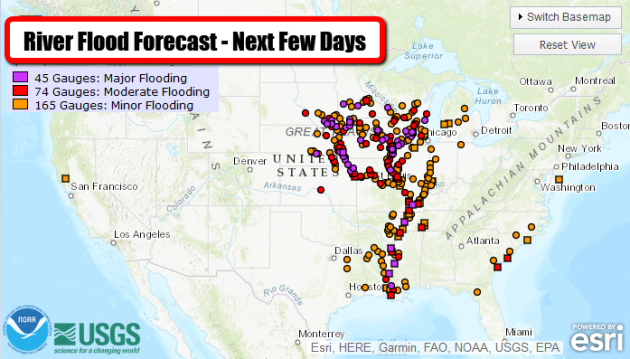 River flooding will continue to be an issue over the next several days across the central United States as water continues to flow downstream and more snowmelt occurs in the upper Midwest. NWS Grand Forks updated their Spring Flood Outlook late last week, saying that they now expect a top 10 runoff year with moderate to major river flooding expected along and near the Red River. You can view their latest Spring Flood Outlook by clicking here. 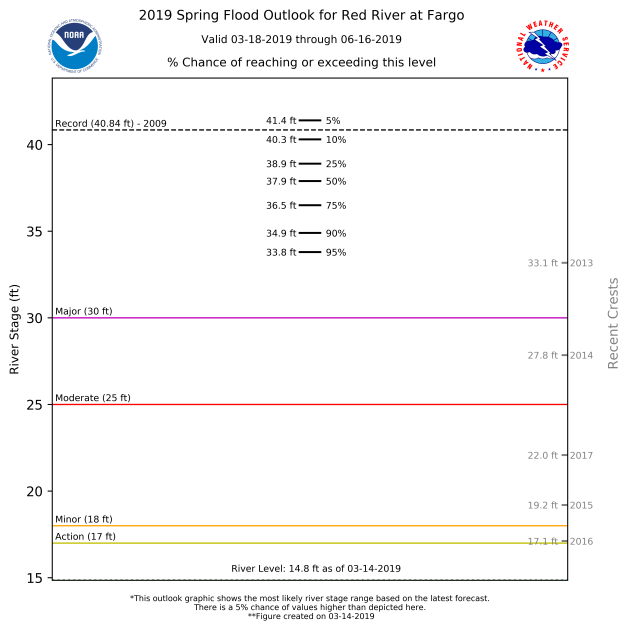 Here's the current flood potential for the Red River in Fargo. There's a 95% chance that the river reaches a level higher than it has been since 2013, but less than a 10% chance it reaches the record set in 2009. Of course, we've already seen flooding issues this past week in parts of southern Minnesota, and we could continue to see those issues as more snow melts over the next few weeks and water flows from tributaries into the main stem rivers. 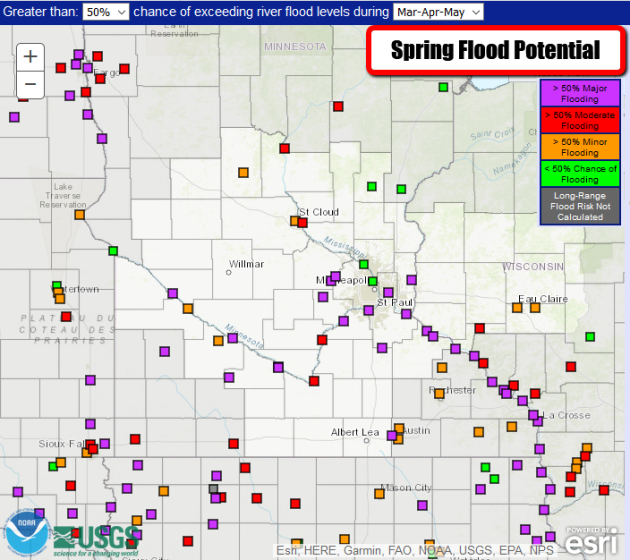 This map above (interactive verison here) shows the potential of area river forecast points reaching certain river levels through the spring. Major rivers like the Minnesota and Mississppi have at least a 50% chance of reaching major flood stage in severals areas, indicated by the purple squares. For example, the Mississippi River at St. Paul has a greater than 95% chance of reaching major flood stage which is 17ft. "Progress is not an illusion, it happens, but it is slow and invariably disappointing" wrote George Orwell. We've had a rather Orwellian winter. The Olympic-size skating rink on my driveway last week is gone. Patches of lawn are reappearing. Cardinals in my yard are letting out a few tentative chirps. I'm anxious to whine about humidity, weekend thunderstorms and tick sightings. Soon enough. The last time MSP saw 50 degrees was November 1, 2018. 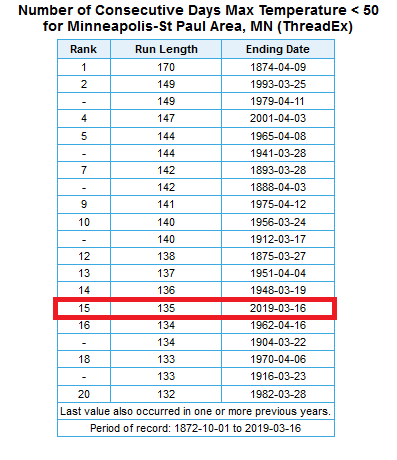 That's 136 days ago - the 15th longest streak at/below 50F since 1872. We're due for a warm front, and it's coming - possibly faster than we want - with spring river flooding in mind. 40s give way to 50s by late week, as we get an early preview of April. Expect a dry week, but a rain shower may pop up on Sunday. ECMWF guidance keeps the next big, southern storm south of Minnesota one week from today, followed by a slight cool-down. The scope of flooding in parts of Nebraska and Iowa is staggering. Minnesotans who've had problems with rising rivers in years gone by should have a plan and be ready. MONDAY: More clouds than sun. High 38. Low 27. Chance of precipitation 10%. Wind W 7-12 mph. TUESDAY: Intervals of sun, milder. High 45. Low 30. Chance of precipitation 10%. Wind SW 7-12 mph. WEDNESDAY: Partly sunny and pleasant. High 46. Low 33. Chance of precipitation 10%. Wind NW 7-12 mph. THURSDAY: First 50 since Nov. 1? Bring it. High 50. Low 33. Chance of precipitation 10%. Wind W 7-12 mph. FRIDAY: Early fog possible, then PM sun. High 53. Low 35. Chance of precipitation 10%. Wind W 5-10 mph. SATURDAY: Some sun, drier day of the weekend. High 52. Low 38. Chance of precipitation 20%. Wind SW 5-10 mph. SUNDAY: Rain shower possible. Touch of April. High 55. Low 36. Chance of precipitation 30%. Wind SW 5-10 mph. 1968: No one was hurt when an early season tornado touches down in Watonwan County. Mainly cloudy skies are expected Monday across a good portion of the state, with a few rain/snow showers possible across northern Minnesota. 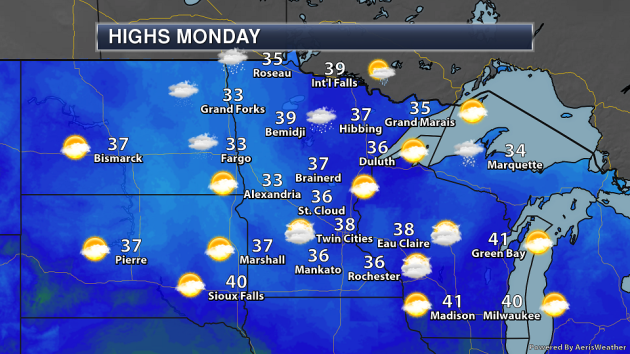 Highs will climb into the 30s statewide to begin the work week. 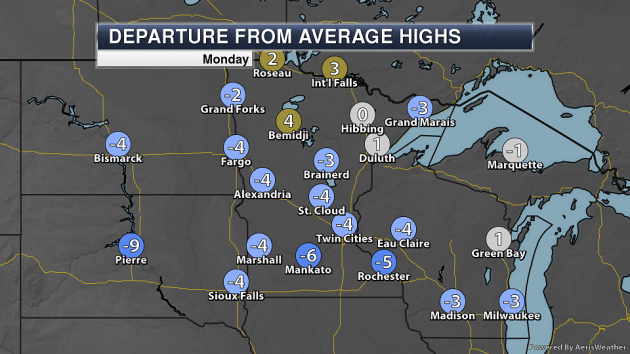 Highs across parts of northern Minnesota will be slightly above average Monday, while the rest of the state sees highs that are up to about 6F below average. The average high in the Twin Cities for March 18th is 42F. 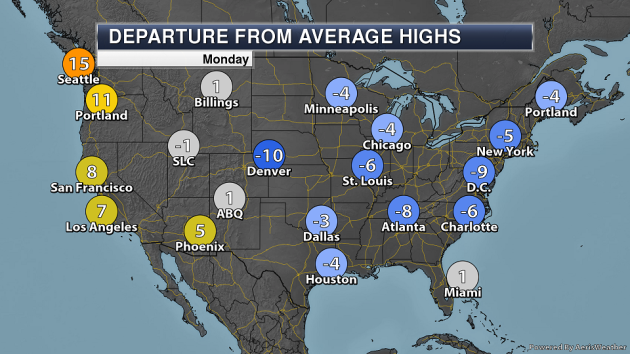 Highs will continue to climb this week, and as mentioned above they should be in the 50s by the end of the week. Some models even try to make a run toward 60F Saturday. We'll see mainly dry weather this upcoming week in the Twin Cities. There is some disagreement between the GFS and Euro as to what will happen next weekend - the GFS brings in some light rain next Sunday as it has a weaker blocking high in the central U.S., but the Euro (with a stronger high) keeps rain chances mainly across far southern Minnesota. That'll be something to keep an eye on, but even then it looks like it would be a lighter rain right now. 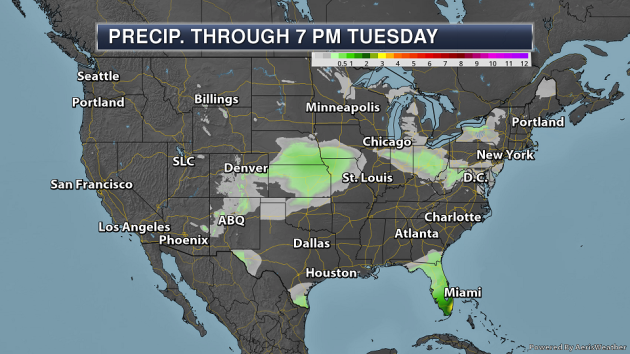 It's going to be a fairly quiet Monday across much of the nation. An area of low pressure moving through the Mid-Atlantic will be enough for some rain and/or snow showers as far north as New York City. Some other scattered areas of snow will be possible in the Great Lakes region and around the Red River of the North. Showers and a few storms will occur across the Florida peninsula. Meanwhile, an area of low pressure will spark off a few rain/snow showers by the end of the day from Denver and Colorado Springs into Nebraska. 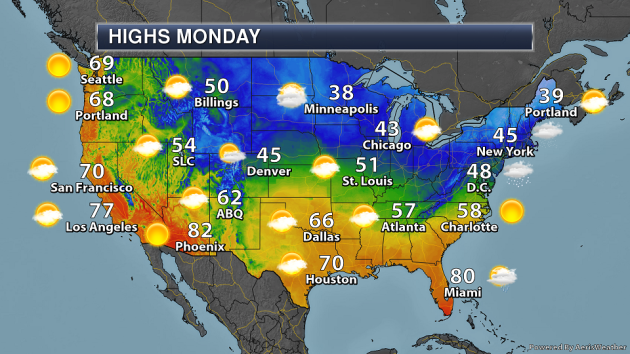 Highs will be below average east of the Rockies, meanwhile highs will climb into the upper 60s in Seattle (WA) and Portland (OR). 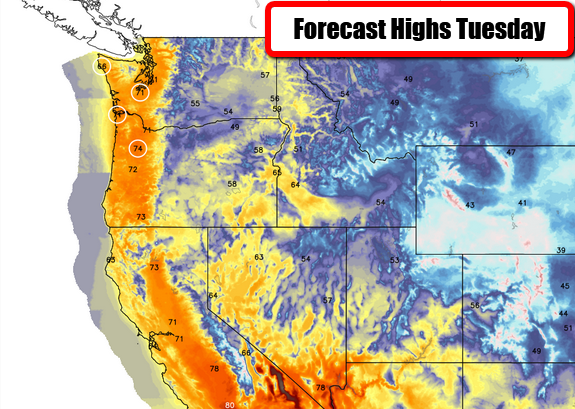 The warmth will continue in the Northwest Tuesday, with record highs possible in Olympia and Quillayute (WA), as well as Astoria and Salem (OR). The heaviest rain through Tuesday evening will be across parts of southern Florida, where 1-3" of rain could fall in the Miami and West Palm Beach areas. 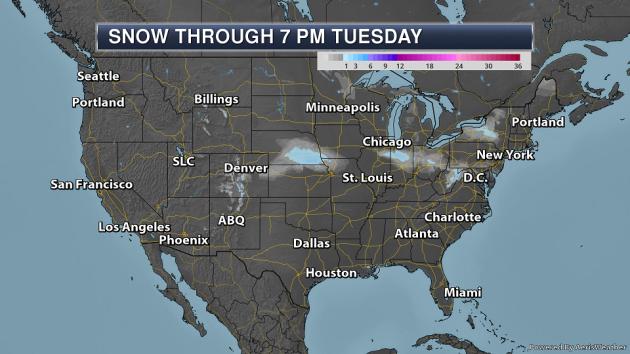 Through Tuesday evening, mainly light snow is expected in areas that will see the white stuff fall. In parts of southeastern Nebraska and parts of the Rockies it could add up to a couple inches. More from Earther: "For the first time since 2011, the entire state of California is free of drought. The U.S. Drought Monitor released new information on the state’s drought levels Thursday. The entire state is drought free, although “abnormally dry” conditions persist in nearly 7 percent of the state, per the Drought Monitor. That’s quite a shift from even three months ago, when much of the state was in severe drought. Californians can thank all that record-breaking rain they’ve been getting." More from the New York Times: "It’s a green big deal for a tiny sliver of a country. Costa Rica, population 5 million, wants to wean itself from fossil fuels by 2050, and the chief evangelist of the idea is a 38-year-old urban planner named Claudia Dobles who also happens to be the first lady. Every country will have to aspire to something similar, scientists say, if the world is to avert the most dire consequences of global warming. And while Costa Rica’s carbon footprint is tiny compared to other countries, Ms. Dobles has a higher goal in mind: Getting rid of fossil fuels would show the world that a small country can be a leader on an awesome problem and improve the health and well-being of its citizens in the bargain. It would, she said, combat a “sense of negativity and chaos” in the face of global warming. “We need to start providing answers.”"
More from InsideClimate News: "For two years, the Trump administration has been planting seeds of change in the Environmental Protection Agency—installing allies of regulated industries onto its elite panels of science advisers. That effort now has borne fruit in dramatic fashion. The EPA's new science advisers, sweeping aside decades of research on the grave health risks of fine particle air pollution, have launched a drive to force the agency to give greater weight to a handful of contrarian studies that dispute the harmful effects of soot. Particulate matter is the pollution caused by combustion, a mixture of solid and liquid droplets that forms in the burning of fossil fuels or wood. The health risks of particulate matter have been an underpinning of the EPA's cost-benefit analysis of a number of air pollution regulations, including those meant to address climate change, like the Obama administration's Clean Air Act."